De hele bachelor studie duurt drie jaar. Elk jaar bestaat uit vier blokken van tien weken. Elk blok wordt afgesloten met een tentamenweek. In je eerste jaar volg je per week 12 tot 18 uur aan onderwijs. In je eerste jaar volg je een reeks aan vakken als basis voor de rest van je Bachelor. Deze vakken zijn verplicht en volgt elk eerstejaars student Engels en is gelijk aan 60 EC. Improve your speaking proficiency by practising your pronunciation, among other things, and improve your listening skills too. Improve your writing by focusing on skills such as developing an argument, reading English literature classics, working through a writing and editing process and having discussions. Everything there is to know about English grammar, in both historical English as well as contemporary English. Learn to apply the most commonly used grammatical rules and become acquainted with different accents in English. In this introduction to English literature from the early middle ages to the death of Charles I, you will read texts and analyse their relationship to society during that period. This course provides an introduction to core concepts in the areas of syntax, morphology, phonology and phonetics, aiming at a sophisticated understanding of native speakers’ unconscious knowledge of the structure of English words and sentences, and a basic understanding of the way in which this knowledge is acquired. Read modern literature and learn about the historical significance of these texts, while also learning to write an academic essay about the texts you have studied. How do people learn languages? Is there a difference between the way children and adults acquire a second language? Study research dealing with these questions and carry out your own research project. This course introduces some of the key literary works of American literature written or set during the mid-nineteenth to mid-twentieth century (1860s to 1960s). Vanaf het tweede jaar ga je je verdiepen binnen het vakgebied Engelse taal en cultuur. Je kunt kiezen uit verschillende samenhangende vakkenpakketten. Elk pakket bestaat uit vier vakken. In de vakomschrijvingen van het 2e jaar vind je terug welke vakken bij welk pakket horen. De vakken binnen deze pakketten kunnen alterneren. Ook dat vind je terug in het vakkenoverzicht. In de even collegejaren wordt vak A aangeboden, in de oneven collegejaren vak B. Een verdieppingspakket bestaat uit zo’n 30 EC, hiernaast zijn er nog andere verplichte vakken, en is er ruimte voor keuzevakken (deze worden verder uitgelegd onder de verdieppingspakketen. Immerse yourself in English and learn to analyse the language in different ways through attention to subjectslike syntax (rules governing sentence structure), semantics (meanings of words and phrases), pragmatics (meanings of sentences in context), and prosody (melody of speech). Study the different ways that English is acquired (as a first and second language), and how different aspects of the language are used in communication. Explore too the earlier stages of English and how and why the language has changed over the course of time. This specialisation provides a strong foundation for the Master’s programmes in multilingualism and language acquisition, as well as the research Master in linguistics and the teacher training Master’s programme. Click here for more information about the courses. Study the literature of the British Isles within cultural-historical and national frameworks, and prepare yourself for Master’s programmes in the field of historical and modern literature. This specialisation is also a good basis for the teacher training Master’s programme, where you will learn to create a literature lesson plan. Click here for more information about the courses. Upon completion of these courses, you will have acquired the requisite literary knowledge to conduct research within the areas of creative writing and translation. Learn to approach literature from both theoretical and practical perspectives, while deepening your understanding of translation by means of a case study. You will apply your knowledge in the Creative Writing course. This specialisation provides a strong foundation for translation, but is also compatible with the teacher training Master’s programme. Click here for more information about the courses. This specialisation focuses on how people use varieties of English and other languages in different contexts.You will learn theory and research practices from the fields of sociolinguistics, linguistic anthropology, life writing, and language pedagogy. You will study and write about connections between language variation and identities while considering applications for educational contexts. This specialisation provides a strong foundation for the Master’s programmes in multilingualism and language acquisition, intercultural communication, as well as the teacher training Master’s programme. Click here for more information about the courses. In je tweede en derde jaar is je profileringsruimte, hierin kun je vakken volgen van andere studies of van andere verdieppingspakketen. In het tweede jaar kun je deze keuzevakken kiezen in blok 2 en blok 3. In je derde jaar heb je nog meer ruimte om te kiezen. Je kan hier kiezen voor een Minor in een ander vakgebied, een stage, of bijvoorbeeld studeren in het buitenland. In je derde jaar is het gebruikelijk om je Bachelor scriptie te schrijven. 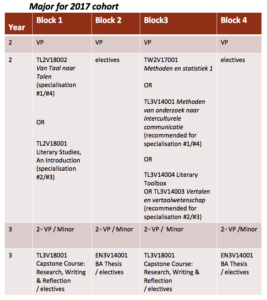 Ter voorbereiding op je scriptie wordt er in blok 1 en in blok 3 van je derde jaar een vak gegeven die je hier voor klaarstoomt, je scriptie kun je dan schrijven in blok 2, 3 (wanneer je de Captstone course hebt voltooid) of in blok 4. 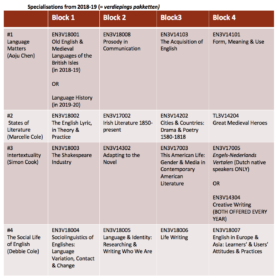 EN3V14001BA Thesis Written in year 3 block 2, 3 or 4 after COMPULSORY Capstone Course. Second VP/Minor can be replaced by 30 ECTS abroad.